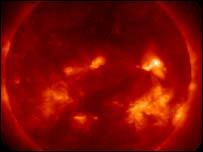 Scientists are warning that the spurt of dramatic solar activity may not be over yet. One astronomer described the two large gas clouds that reached the Earth earlier this week as "unprecedented". 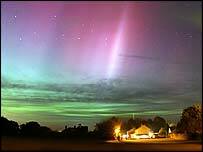 However, experts say that although unusual, the events are not beyond the bounds of "normal" solar activity. They say the flares do not represent any significant change in our Sun's behaviour as there has only been 25 years of monitoring from space. Earlier this week, aircraft traversing the north Atlantic were confined to a narrow corridor to minimise radiation exposure, and astronauts on board the International Space Station (ISS) took shelter in its most shielded section. Two Japanese satellites malfunctioned and work had to stop on a Norwegian highway that relied on satellite positioning. The sunspots - areas of recent explosions that sent charged gas clouds heading our way - have now moved so that the Earth in no longer in the "line of fire". However, astronomers say that the Sun may not have finished with us yet. Commenting on the solar events of the past few days, John Kohl of the Harvard-Smithsonian Center for Astrophysics in the US, said: "It's like the Earth is looking right down the barrel of a giant gun pointed at us by the Sun... and it's taken two big shots at us." "The Sun is really churned up. The timing of two very large X-class flares aimed directly at the Earth, occurring one right after another, is unprecedented. "I have not seen anything like it in my entire career as a solar physicist. The probability of this happening is so low that it is a statistical anomaly." As a precaution, astronauts Michael Foale and Alexander Kaleri on board the ISS spent 20 minutes per orbit in the Zvezda module - the most protected area of the station - while the ISS passed through high magnetic latitudes. It is a routine procedure and astronauts have done it twice before - in April and November 2001. En route to the Red Planet, the Mars Express spacecraft was hit by the cloud of charged particles but it was designed to withstand these events. The Smart 1 mission, spiralling its way to the Moon, has suffered some disruption of its "ion" engine. At one point, the engine automatically shut down, but restarted itself later without problem. Radiation monitors on other spacecraft in highly elliptical orbits had detected radiation, probably coming from the solar flare. These spacecraft, XMM-Newton and Integral, are safe and fully operational. In 2001, XMM-Newton survived the largest solar flare ever recorded, and mission scientists had no reason to be concerned about the effects of this week's events. An astronomer at the University of Iowa has even managed to detect the "sounds" made by the first storm - a clicking noise followed by a whoosh. Donald Gurnett says the sounds of the solar flare were picked up on Tuesday by the US space agency's Cassini spacecraft as it heads for a rendezvous with Saturn and its moons.